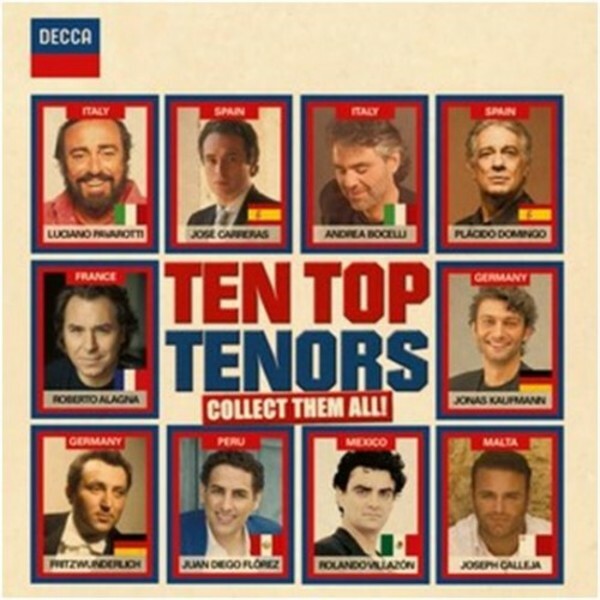 This 2CD album brings together ten of the most famous tenors, performing nearly 50 of the greatest arias of all time. It also features a 16-page booklet with everything you need to know about each tenor � nationality, short biography, best recording, trivia and more � in an appealing and witty design. CD 1 contains 24 operatic arias, opening with the all-time tenor of tenors, Luciano Pavarotti, singing 'Nessun Dorma'. Juan Diego Fl�rez delivers the astonishing 'Ah mes amis' (with its 9 top Cs) in supreme style, Villaz�n sings Verdi and Handel, while Jonas Kaufmann can be heard in Puccini, Bizet (Carmen) and even Wagner. CD 2 contains film themes, Neopolitan songs, Sicilian songs, sacred music and others. Highlights include Andrea Bocelli�s Ave Maria (from his best-selling 'Sacred Arias' album), Joseph Calleja singing the 'love theme' from Cinema Paradiso, Pl�cido Domingo with No Puedo Ser and Jos� Carreras singing Granada.